We look to those who have reached the pinnacle of their professions—be it LeBron James, Reese Witherspoon or Barack Obama—and daydream about how great it would be to reach that level of super-stardom. But, with all the respect and recognition that is attached to these celebri-leaders, also comes the more negative side—the barrage of criticism these people face. The president or the Oscar-winning actress can’t please everyone all the time. One person may like an initiative or a movie, and another will very well condemn it. It’s just natural because they’re under the limelight—being judged by the masses—all sorts of different ideologies, beliefs and backgrounds. Generally speaking, if you want to be in that super-skin, you need to take the heat that comes with it. To survive, you’ll thicken that skin. If you can’t take the heat, you’ll never make it. I mean, have you ever seen Joan Rivers tear up a celebu-tante on the red carpet, or Rush Limbaugh or Bill Maher get personal with a political figure, even tearing their “choice” of family members to shreds? Do you think it’s easy for LeBron to hear the analysts critique his game performance or read a scathing headline? Though an extreme example, you should expect, when you’ve taken on ANY position in leadership, others will feel entitled to an opinion about your performance, just by virtue of the responsibility you wear. Listen. You may be quick to interrupt or state your case. Stop. Hold on. Absorb what the person with the beef has to say. Wait for them to finish, just as you would want if the tables were turned. Consider the source. Does this person have a genuine grievance? Or are they just jealous? Have a track record of being insubordinate? To gain this perspective, you may need to reach out to fellow peers or mentors. Ask them about the alleged criticism. Find out if it’s truly justified from objective parties you can respect. Don’t take it personally. This may well be the hardest tip to follow. We naturally take the criticism personally—after all it’s your “brand” out there on the line. Resist that urge. Maintain objectivity. Otherwise, you won’t get anything good out of this experience. Only bad. Stay calm. Take a deep breath. One of the worst things you can do is be reactive and lash out. As hard as it may be, you need to take the time and have the presence of mind to explore whether or not this criticism is founded. Ask clarifying questions. If a blanket criticism is made, of course, you’ll feel like it doesn’t hold much water. Ask for specifics—details about where you allegedly went wrong. You can only objectively judge if the criticism has merit if you have these details. And you most certainly can’t remedy the situation if you don’t have these specifics to work with. Take ownership. You’re human. Like everybody else, you will make mistakes from time to time. If you really have wronged someone or some people, you need to own up to it. As I’ve discussed before, here and here, there is an art to doing the grown-up thing and being that strong leader. Embrace the message. As a leader, you are in the seemingly counterintuitive position of VALUING criticism. Because of your position, it’s only natural that people will have a beef with you from time to time. You need to look at this as almost an honor–that people are so invested in the team or the organization that they are willing to put themselves on the line to make that, perhaps, brash opinion. You just might have something to learn from what seems like the most ugly criticism from the outset. There could be beautiful rewards in the end when you address the criticism. Take action. 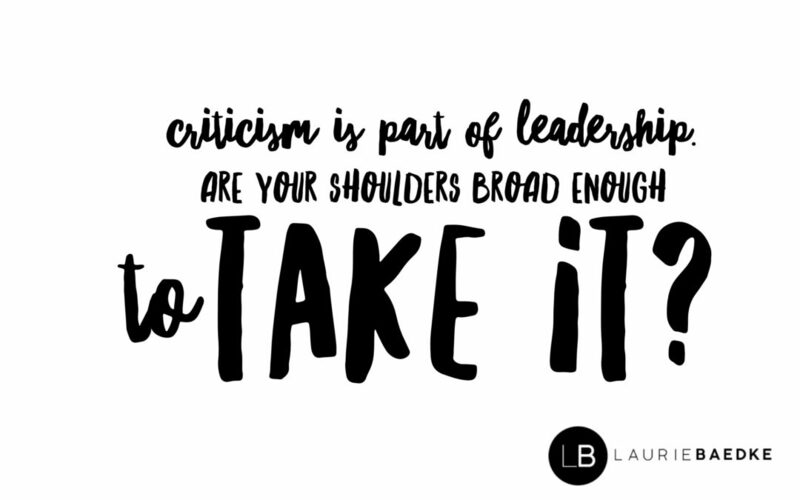 Yes, you need to do more than just nod and speak to the criticism. You need to act on it. Value that feedback or experience as an opportunity to grow professionally as a leader. If you grow from this difficult experience, you are unlikely to find yourself in the same situation again. Good for not just you, but the entire team. Let me encourage you to “lean in”; reaching out and getting the feedback that will make you so much better as a person, not just as a leader. It’s how you respond to the feedback you DON’T ASK FOR, though, that most separates the underwhelming leader from the effective standout.